There's nothing random about the designs decorating rookie Thatcher Demko or Richard Bachman's newest masks. Players for the Utica Comets, like all professional and amateur hockey skaters, are easily identifiable by the numbers on their jerseys. The one exception on all levels of competition - goalies. Over the past couple of weeks, Comets' goalies Demko and Bachman have added a little more color to their game - literally. Have you taken an extra long stare at their masks and additional equipment lately? Their passions are expressed in new paint jobs by Dave Gunnarsson of DaveArt Studios. Exchanges of emails, along with sketches and ideas depicting their visions, culminated with the new displays for all to inspect. "It's an opportunity for a goalie to be creative and have fun," says the rookie about designing his latest mask. "Dave and I did some brainstorming; emailing each other back and forth." Dave, who both Demko and Bachman entrusted their mental images to transfer onto their masks, is the best of the best in the business of painting hockey masks. Smaland, Sweden is where Gunnarsson's studio cranks out hundreds of personalized masks annually. Gunnarsson, 38, has been an airbrush artist since age 16. Specializing in NHL mask art, he is the official artist of Bauer Masks for the NHL. Team logos, cartoons, tributes, anything fitting for the goalies and their equipment, and team colors are on the table for Gunnarsson. For Demko, one glance at the back plate of his mask, it's clear who was on his mind when sending emails to Sweden. Fictional TV anchorman Ron Burgundy, portrayed by actor Will Ferrell in two theatrical releases about the San Diego channel 4 icon, has a special place in Demko's heart. "It's a tribute to San Diego", tells the first-year Comet goalie. "I'm from San Diego. It's (Anchorman: The Legend of Ron Burgundy) my favorite movie. I wanted to honor the channel 4 news team." 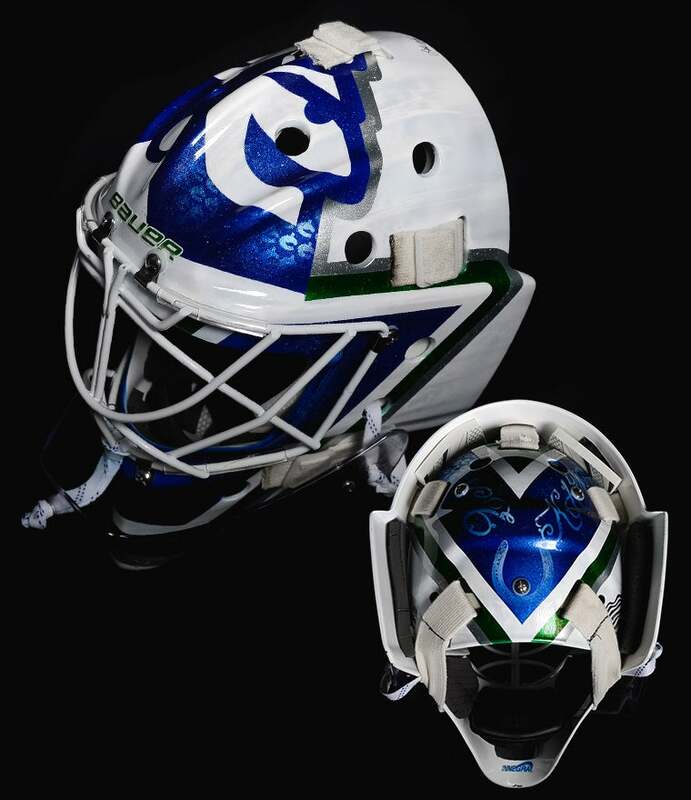 The Boston College logo (Demko's alma mater), as well as paying homage to his late friend Ian Jenkins, are included on Demko's recently arrived mask. 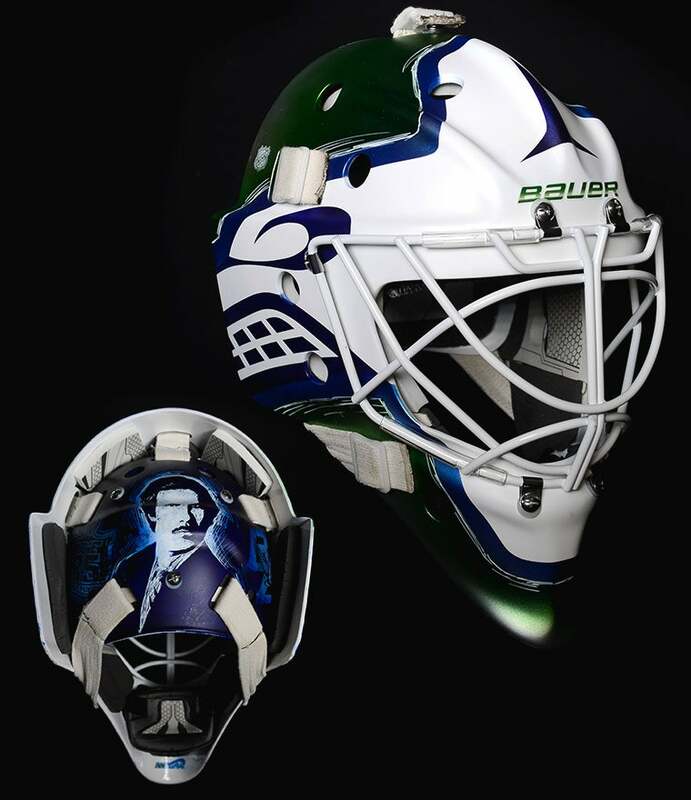 Once a picture was completed of what the finished product would appear as, Demko said that within three to four days his mask was ready for shipping. For Bachman, the word magic comes up, when describing his dealings with Gunnarsson. "You draw a sketch, and he'll find an idea - and do magic," according to Bachman, now in his second season with the Comets. Wanting to change it up this time around, Bachman went for a design totally new to his mask collection. After having Bachman-Turner Overdrive, a Canadian rock band of the1970's, variations of author Stephen King (who penned a collection of short novels by the pseudonym Richard Bachman), including the 1980 film The Shining, the Comets' goalie with 42 NHL games to his credit went "old school" this time around. "It's super clean," describes Bachman of his latest Gunnarsson piece. "Johnny Canuck and the "V" logo is what I went for. And on the back plate I have the U.S. and Canadian flags, my son's initials, my late brother's initials and horses." Bachman, like Demko, tells of saving all his previous masks, prior to having their latest edition posted to The AUD. "I have between 12-15 masks at home, including the very first one I had that my dad and I painted when we lived in Saranac Lake (NY)." Whereas masks, for goalies allow for a personal statement to be on display 60 minutes a game, their choices for legs pads, blocker, and catch glove allow them to keep shots from going in net. In uniform with their mask, jersey, and pants, to a lesser degree, goalies' leg pads, catch glove, and blocker, also make a creative statement. As Bachman led his teammates out onto the ice for this past Friday's home contest with the Albany Devils at The AUD, during warm-ups his pads had few puck marks. 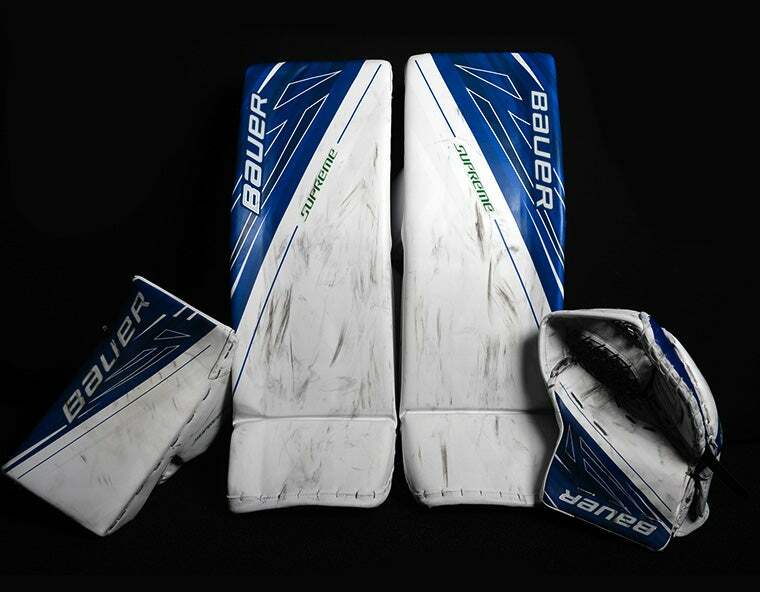 The Bauer pads are white with blue trim, with the same matching pattern incorporated on his glove and blocker. "When the glove is sent to us, it's already broken in by a factory machine," describes Bachman, much the same as a baseball player would mold their fielder's glove. Along with an already flexible catcher, Bachman says that after first putting on his new set of gloves after a morning skate, he more than likely will use them that same night in a game. A day or two, at the most, for Bachman, who resides in the off-season in the Denver area, is his timetable for making his new gear officially used. When it comes to leg pads, two or three skates, then Bachman declares them gameday ready. Pads, unlike the catcher glove, aren't factory broken in. Demko's gear, too, is relatively free of black rubber pings. 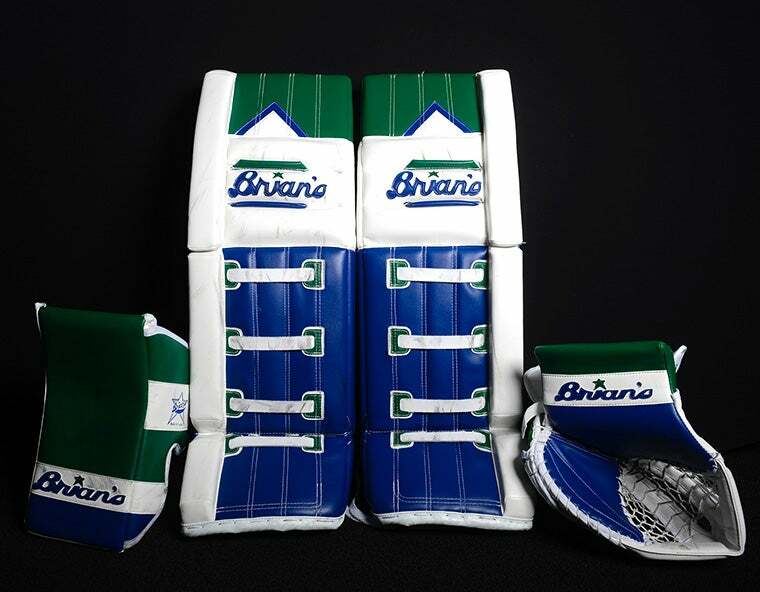 The Comets' rookie netminder's color combination of green, blue and white is in traditional Canucks' scheme. The leg pads are green, with white stripes applied. On the sides of the pads, there is a hint of blue. "One or two skates and I'm ready," explains Demko of his break-in period for gear. "Some guys want a little longer to get them (pads) ready." Although he can't supply an exact number, Demko tells of having a "garage full" of equipment back home in San Diego, including one dozen pair of pads.